In 1888, the Table Rock tunnel was originally built. On May 24th, 1893, the Chippawa to Queenston single track railway was officially opened to the public. The Railway was granted a 40 year lease at a fee of $10,000 per year in order to generate money. Later, in 1984, a second track was laid. In 1894, the Niagara Parks Greenhouse was built. It is located opposite the Toronto Power Station south of the Horseshoe Falls. The Greenhouse remains in operation today and is open year round. In the early 1900’s, Queen Victoria Park near the Horseshoe Falls was known as "The Front". This was an area where tourism and entrepreneurialism mixed together. This unfortunately resulted in numerous side shows appearing along near the Falls. Legislation was subsequently passed to restrict such activities. The area of River Road at the base of Clifton Hill has always been an area busy with tourists. This was in part because of the Falls View International Bridge located nearby. In the early 1900’s, the Frontier Amusement Park was located on a 5 acre parcel of land on which the Crowne Plaza Niagara Falls – Fallsview Hotel (formerly the Brock Plaza) is now situated. The amusement park remained in operation until it closed due to financial difficulties in 1909. In 1904, the new Refectory Restaurant was built. In 1860, the original Refectory (Victoria Park Restaurant) was built. During its existence it served as Thomas Barnett’s Museum. From 1889 to 1902, it was known as the Dufferin Cafe. In 1902, the Ontario Power Company needed the land where the Dufferin cafe was located. In 1904, the new Refectory Restaurant was built and remains in operation today. The name "Refectory" is the name for a room used for meals in a monastery. In 1907, the observation buildings at Ramblers Rest and Inspiration Point were rebuilt with stone. The Ramblers Rest building remains in use today. In 1908, electric incandescent lights were erected on existing trolley posts throughout the park. In 1916, tungsten lights replaced the incandescent lights. In 1908, government authority was received by the Niagara Parks Commission to begin its expansion along the shoreline of the Niagara River between Lake Erie and Lake Ontario through land expropriation. Construction of the Niagara Parkway began but it was created in well planned and designed segments. In 1912, the Niagara Parkway from Queen Victoria Park to Bridgeburg (currently known as Fort Erie) was completed. In 1914, the spring water reservoirs at Table Rock and the Refectory Restaurant were replaced. Spring water use was discontinued because of contamination. In 1915, the Niagara Parkway from Chippawa to Fort Erie was completed. In 1919, the Niagara Parks Commission took over control and operation of the Table Rock House. In 1920, the Queenston Heights Restaurant was built. It is located within Queenston Heights Park overlooking the beautiful lower Niagara River. The restaurant is open year round. In 1921, the Niagara Parkway from the Niagara River Whirlpool to the Niagara Glen was completed. In 1921, sanitary drinking fountains were installed in the park. In 1923, the Niagara Glen Restaurant was built. Today it functions as a souvenir shop and snack bar. It is open on a seasonal basis. In 1923, the Niagara Parkway had been extended to Queenston. In 1926, the Niagara Parks Commission Administration Building was built. Today it is located in Queen Victoria Park across from the American Falls and is home of the Niagara Parks Police. In 1926, the old Table Rock House was torn down. It was replaced by a new building located farther South. In 1926, the Refectory Restaurant was renovated. By 1931, the entire Niagara River Parkway from Lake Erie to Lake Ontario was completed. The original section of River Road was a toll road but those tolls were removed soon after when it was realized that the tolls were choking off access to other areas along the Niagara Parkway. On July 26th, 1936, the Niagara Parks School of Horticulture was established on a 200 acre site a short distance north of the Niagara Glen. Today the Niagara Parks Commission Botanical Gardens and School of Horticulture is world renown. In addition to its many thousands of assorted plant and tree species, it is also revered as a school for the budding student horticulturists. In the latter months of 1996, the Niagara Parks Commission opened a world class Butterfly Conservatory on the grounds of the gardens. The Butterfly Conservatory & Botanical Gardens are open year round, although the gardens are much prettier in summer and fall. In 1939, during World War II, Canadian Military Forces guarded all hydro electric power plants. Barbed wire barriers were laid so that the closest point that tourists could view the Falls from was the Refectory Restaurant. In 1945, the main Table Rock tunnel was replaced with a new tunnel. In 1948, The Princess Elizabeth Building was constructed. It was located along River Road opposite Clifton Hill. It was utilized as the ticket office for the Maid of the Mist as well as a souvenir shop and snack bar. Presently it has been replaced by the new Maid of the Mist Complex. In 1952, the movie "Niagara" featuring Marilyn Monroe was filmed. In 1959, the Clifton Hill/River Road area underwent rejuvenation when Louis Tussaud’s English Wax Museum was built on Clifton Hill. Further development followed with the building of more attractions and motels in the area. 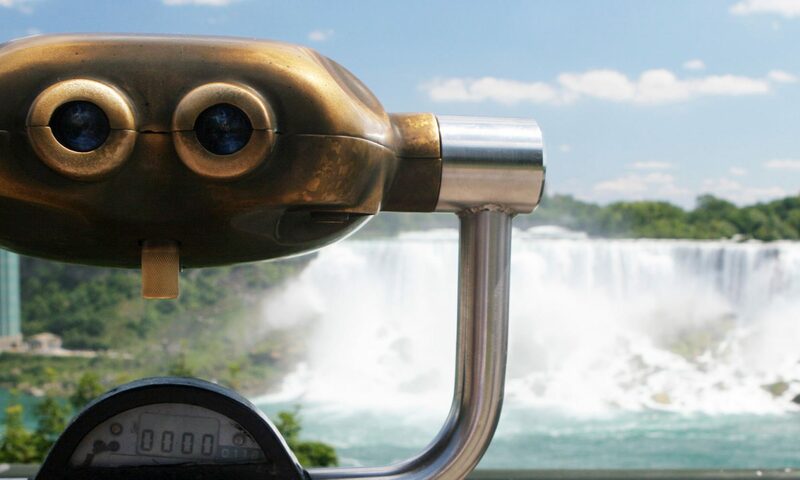 Mr. Charles Augoperger, a lawyer from Buffalo, New York came to Niagara Falls with a dream of building an observation tower above the Falls. In July of 1962, the Seagram Tower (currently known as the Minolta Tower) was opened to the public. At 325 feet above ground level and built on the top of the glacial moraine in the Falls View area, it was, at the time, the tallest structure around. In latter months of 1964, the Skylon Tower officially opened to the public. The Skylon Tower became the tallest structure in Niagara Falls at 775 feet above the Niagara River basin. In 1966, the Niagara Parks Commission built an Incline Railway between the Table Rock at the edge of the Horseshoe Falls and the Falls View area above to the Seagram Tower (currently the Minolta Tower). The Falls View area is located on the top of the glacial moraine which borders the Western edge of the park. This made both areas easily accessible. In 1985, the People Mover Transit System began operation.